If you would like to personalize your order or have certain colors/elements/flowers/herbs you would absolutely like to see in your creation, please denote it here. Keep in mind our creations vary per piece and are made with materials we have on hand. Welcome, Serenity. 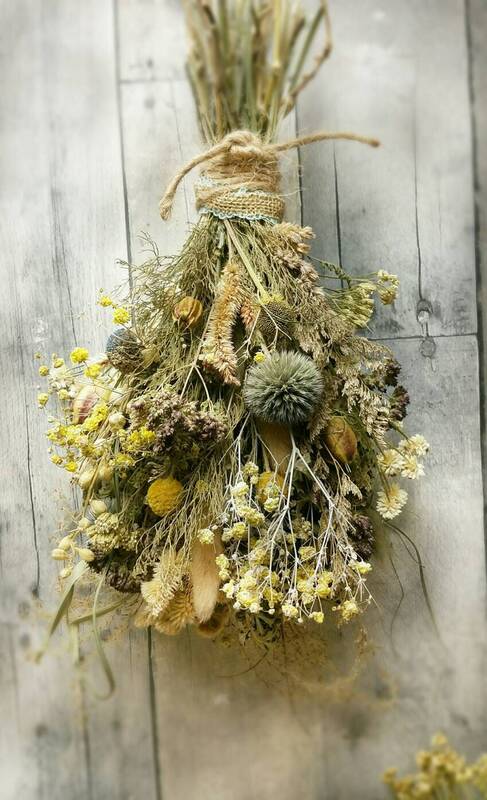 A mixture of various dried herbs and flowers. A lovely addition to any home. Features calming colors with a touch of White, yellow, purple & Gray Blue. Limited Edition. Wonderful natural decor for your living room for a nice year 'round decoration. Each hanging bouquet is different, and not exactly the same, but will be beautiful none the less. Small Measures approximately 7 to 9 inches tall and 4 to 5 inches wide. Set of 3. Stems wrapped in jute with burlap and coordinating lace accent ribbon and has jute loop in back for hanging. Your choice of Tissue Paper Color: White, Green, Purple, Yellow, Cats, Birds, or Butterflies. Custom orders are welcome! Just click the custom order button and lets see what beautiful thing we can come up with! This is a sample of a Dessert Jar that has been gift wrapped. Super quick shipping, the product is of good quality, great seller! Beautiful bouquet! Fast shipping and packaged beautifully! Many thanks for everything! Thanks, this smells great. Definitely would buy again. Dried flower bunches (6) arrived fast! Ready to hang on my wooden drying rack over sofa. Customizing each bunch was easy and fast; we asked for flowers that are found where we live. Nice! Thank you! We offer Debit and credit card payments! We accept Visa, Mastercard, American Express and Discover. We also accept paypal. Payment is expected within 2 days of purchase. The faster you pay, the faster I ship! If payment is not made within 2 days, the item will go back up for sale and the order will be cancelled. For seasonal items that are made and sold it is on a first come first served/paid basis. If a listing for special order is created and is not paid for, a paid order that comes in after that order that is not paid for will be given first priority. In order to receive a coupon code discount, you must use the coupon code at the time of order in order to receive it. All of my sales are final unless you feel that the item has been grossly misrepresented in either the item description or in the picture. If the purchaser is unsure or is not clear about a measurement/ingredients or material of an item (or needs clarification) it is up to the purchaser to verify information if it has not been supplied. Before you leave a negative or neutral review, Please email me if you are unhappy with your purchase when you receive it and we will work together to try and fix the problem. If return of a product (a re-sellable item) is deemed to be necessary, the return shipping costs are the responsibility of the purchaser. Insurance on the returned item (for items of higher value), for the full purchase amount as well as delivery confirmation on the returned package is mandatory and all costs associated with these services are the responsibility of the purchaser. Once the item has been returned to me and it's original as shipped condition has been verified a refund will be issued to the purchaser LESS the shipping costs. Items mainly ship first class parcel post or priority mail via USPS but on occasion will switch to another shipper/way of shipping based solely on weight/cost ratio. All delivery guidelines obtained from the USPS website are an estimated delivery time, not a guarantee. High volume, holidays, and bad weather are factors which can alter delivery time given. Please note, the shipping/handling calculation is based on Retail price USPS charges based on zipcode, weight and size of package and associated fees. If you are making multiple purchases, shipping will be combined. Please, if you have changed your address or would like your order shipped to a different address from the one listed on your paypal account, drop me a separate convo stating the address that you would like to have your purchase shipped to or make a note in the notes section. Once package is dropped off at the Post Office it's delivery speed is out of Rhodes Creation's control. I can help you locate your tracking information and assist you with the shipping process, but please keep in mind that USPS is a separate entity from Rhodes Creations. Rhodes Creations is not responsible for any USPS lost packages. Please contact USPS if you fear your package has is lost in the mail. It is not Rhodes Creation's responsibility to contact USPS about a lost/missing package. I can provide insurance for your packages if you are worried about a non-delivery. Insurance can be purchased for an additional fee. Please leave a note in "message to seller" at checkout and we will invoice you for the amount of this extra service. Most items ship within 1-3 business days. Once a design is agreed upon, Special orders ship anywhere from 1-3 weeks. Please note: Shop policies are subject to change as deemed by the shop owner. Q: How do I contact you if I have a question or concern about my order or a product? A: Please contact us with any questions or concerns, especially if it has anything to do with your order. You may do this by clicking the contact button. It will direct to our email as an Etsy conversation. It is preferred to keep the communication within Etsy so I can have future reference to the communication. Q: Do you sell in bulk or wholesale? A: I have a wholesale agreement and terms I can send to you to review and fill out. I sell certain items in bulk and can make discounts in bulk on qualifying items. Just contact me to find out more information. A: Most certainly! Just hit the custom order button and we can see what beautiful things we can come up with! Q: The packaging does not look exactly as in the picture. Why is this? A: Rhodes Creations may at our discretion, substitute types of ingredients, (such as a different type of pasta in a soup mix) based on availability. We may change up the way it is packaged that doesn't affect it's overall look, but may be incremental changes that make it more user friendly. Q: Why is my bouquet not an exact duplicate of the picture in the listing? A: Please note: Each bouquet is made with materials I have on hand and will not necessarily be an exact duplicate of the items pictured. It will contain elements, materials, and colors similar to the pictures. Each one is made with loving care and creativity, to be a special addition to your home. Each bouquet is different, and not exactly the same, but will be beautiful none the less. Q: How are your herbs/flowers dried? A: They are air dried. Q: How do I care for my dried florals? A: Please note that dried florals by nature are fragile and need special care. They are best kept in a dry/cool room temperature and environment away from direct heat/sunlight/moisture/humidity. We don't spray our florals, but the customer may-To further protect them a product such as Krylon Matte Finish may be used to help protect them from dust and fading. Q: I have an issue with my order. What should I do? A: If for any reason you are not satisfied with your order, please contact me first (and we can work together to resolve the problem) before leaving a negative or neutral review. We will do all we can to make things absolutely right and the customer happy and satisfied! Your feedback helps us to do the best we can and improve on our products and production! Q: What kind of atmosphere do your products come from? A: All items come from a smoke-free environment. A: All of my sales are final unless you feel that the item has been grossly misrepresented in either the item description or in the picture. If the purchaser is unsure or is not clear about a measurement/ingredients or material of an item (or needs clarification) it is up to the purchaser to verify information if it has not been supplied. Before you leave a negative or neutral review, Please email me if you are unhappy with your purchase when you receive it and we will work together to try and fix the problem. If return of a product (a re-sellable item) is deemed to be necessary, the return shipping costs are the responsibility of the purchaser. Insurance on the returned item (for items of higher value), for the full purchase amount as well as delivery confirmation on the returned package is mandatory and all costs associated with these services are the responsibility of the purchaser. Once the item has been returned to me and it's original as shipped condition has been verified a refund will be issued to the purchaser LESS the shipping costs. A: We offer Debit and credit card payments! We accept Visa, MasterCard, American Express and Discover. We also accept PayPal. Payment is expected within 2 days of purchase. The faster you pay, the faster I ship! Please note, the shipping/handling calculation is based on Retail price USPS charges based on zip code, weight and size of package and associated fees. If you are making multiple purchases, shipping will be combined. Q: Do you provide insurance for shipping your products? A: Insurance can be purchased for an additional fee. Please leave a note in "message to seller" at checkout and we will invoice you for the amount of this extra service. Q: When can I expect my item to ship? A: Most items ship within 1-3 business days. Dried Hydrangea stems- Various shades-set of 1 to 3*Free Shipping in the U.S.